The surface of your kitchen or your bathroom will be one of the most visible parts of your remodeling project. It will also have to endure the brunt of the wear and tear over the years. For that reason, Beco prides itself on sourcing the right materials for each project. Our designers are versed in the best products for each surface of your home. Beco is proud to offer countertops made from a variety of materials, including: Granite, Quartz, Corian, Soapstone, Stainless Steel, Caesarstone, Marble, Slate, Zodiac, Wood, and Cement. We proudly install quality countertops in Cranbury NJ, Pennington NJ, Washington Crossing NJ, as well as Newtown PA and Yardley PA. There are a myriad of options for faucets, sinks, and other accessories to compliment whichever surface you choose. Our designers will help and guide you through the process of selection to make sure your finished project is exactly as you dreamed of it. Natural stone, by nature, is extremely heat, stain and mildew resistant. It’s very impressive, long-lasting and durable. It is perfect for homes in Cranbury, Pennington and Washington Crossing, NJ. Natural stone will most definitely raise the value of your home. However, some natural stone, such as marble are prone to cracking, chipping and staining. This type of countertop would probably not be a good choice if your counters get a lot of use. Marble is not only beautiful with its naturally random appearance, but can also lend itself to any décor. Its lifetime quality makes it an exquisite choice for countertops, floors and hearths. However, marble can be vulnerable to cleaning products and mild acids commonly found in kitchens. Be sure to talk with your designer when selecting marble for these applications. If installing a tile countertop, the sky’s the limit. You can choose a solid tile, a pattern, or even a mosaic design. Tile is commonly used for backsplash applications, but can easily be installed on a countertop. Tile is best used for a kitchen that is used lightly maybe for baking and light cooking because the tiles scratch easily under force and high heat. You may want to consider using tile for an island or a section of your kitchen that does not get a lot of use. The one downside to tile applications is grout maintenance. Limestone is a type of sedimentary rock found all over the world which features earth tones. Limestone is common around Newtown and Yardley, PA. Countertops with this type of stone have great flexibility in selecting complimentary colors for your cabinetry. There are endless forms of this rock that come in an array of textures, colors, and appearances. Limestone can be a great material to use for flooring, countertops, back splash and vanity tops, but must be sealed due to its porous nature. Travertine is a natural stone material that comes from the limestone family. Travertine is a porous material, and needs to be sealed before use in many applications. Travertine, like marble, is vulnerable to alteration by exposure to mild acids. There are a number of varieties that are suitable for countertop applications, and you should be well educated before making your choice for Travertine countertops. Soapstone is made up of mineral deposits and has a unique soft color with light flowing veins. Soapstone is non-porous, heat and acid durable, however it is recommended to oil your soapstone countertop to help the stone darken evenly. Soapstone usually comes in dark green to green-black coloring, but you may find it in a lighter, almost gray tone as well. Soapstone material comes in smaller slabs, so seams can be visible in countertops longer than seven feet. The only downside to soapstone is that it is soft, so it is susceptible to scratches. Quartz countertops are a factory produced, engineered stone that is a non-porous material, made from a mixture of quartz and resin. It has the look of natural stone, but with a consistent pattern and color. 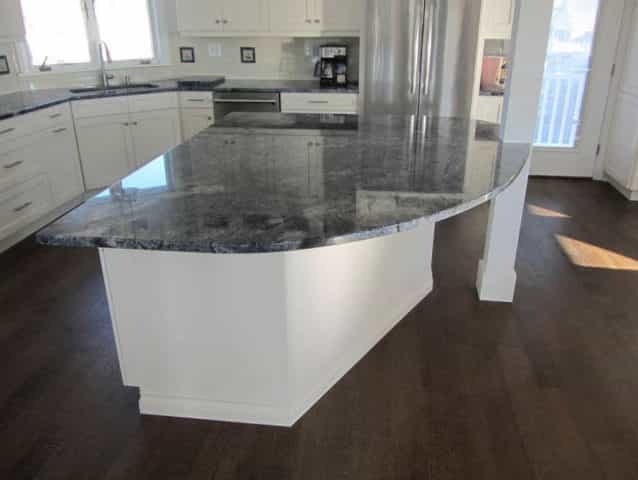 Quartz countertops are non-porous, scratch, heat and stain resistant. Quartz countertops come in many colors and styles, and it is considered the most durable kitchen counter material available. See our stunning Counter tops in our our showroom and our counter tops galleries. We have installed our counter tops in and near Cranbury NJ, Newtown PA, Pennington NJ, Washington Crossing NJ, or Yardley PA. We are proud of our craftsmen and the quality of work that they do.